This thread is for country to country diplomacy, news reports and government announcements. The Imperial Chinese government has declared a unilateral cease-fire in its war against Japan for an indefinite period of time, in order to give negotiators a chance to conclude peace with the new Japanese government. It recommends that Japan and the other powers at war against Japan consider joining in this cease-fire. The Chinese wish to have a white peace but this applies solely to the China vs. Japan aspect of the conflict. China will continue with the war if the very reasonable demands of China's gallant allies are not met. Despite the limitation of have no access to Japan file and giving value to the good will of the Chinese gov. I call for a white peace between our countries (China, US and Germany), restoring all the territories to their former owners since Japan cannot enforce their original demands and the war only can lead to a senseless slaughter between our forces with nothing to gain. I think you won't have access to the Japan .trn file until after an additional turn is run in order to get rid of the Japan password. Thanks to Kensai, I have the control of Japan. I've stopped all the offensive operations to allow the cease-fire. I invite all the great powers to initiate the dialogue. After meeting and discussing the terms of peace between Russian and the Ottomans, the representatives of the parties agreed that talks would speed up if hostilities cease at once. Thus, all Russian forces have been ordered to stand down. Offensive actions have been abandonned and sieges, where applicable, were lifted. Our forces are falling back onto friendly territories, lifiting the sieges, in particular, of Adrianople, Sarajevo and Urfa. Final terms are expected shortly. The Ottoman government confirms the ceasefire with Russia. Although cession of land has been agreed, our stiff resistance has drawn them away from their maximum claims. Examining the field we confirm that all conditions of the ceasefire have been met by the Russian part and we are ready to meat the Russian delegates at the headquarters in Burgas to sign the final treaty. Peace with Romania and Greece will be negotiated seperatly but should be achieved soon. The governments of Italy and the Ottoman Empire announce their will to settle any potential issue between their nations about Lybia once and for good. Therefore the following contract will be set for signing. 1. We declare a Non Aggression Pact between our nations, lasting for 10 years, beginning from the date of signing the treaty. This Pact extends automatically for another 10 years, if no party objects untill three months before the first 10 years end. 2. Tripolis is being sold to Italy for 6000 Statefound and two squadrons of steam commerce ships (clipper ships, if Italy has no steamers). If the transfer of statefound leads into inflation for the Ottoman side, it can chose to have the money being transfered into commerce ships of the same value. 3. Ottoman Empire tranfers Misrata, Amal and Sirt to Italy. Benghazi, Cyrenaica, and Salloum stay with the Ottoman Empire. 4. Ottoman Empire will not interfer with Italy's plans in Lybia outside these four regions. 5. Ottoman Empire gets the license to exploit the nitrates in Tripolis, while Italy gets to exploit the fruits in Cyrenaica. OOC: Here the question is, if we are still having inflation implemented for purchases. Allthough I have high respect for Kensai's knowledge about the game and its engine and though I think he was right in most of the technical discussions, I still believe that for the transfer of actual values there should be no inflation. Also in the regard of exploits I believe that in a moderated game the chances are slim. I put this to player discussion, while I start writing a script for this. 1. Both parties agree to immediatly seize hostilities and declare a state of peace with each other. 2. Both parties agree on a Non Aggression Pact, lasting for 5 years. 3. The Ottoman Empire secedes Kars to Russia. 4. Russia garantees to not interfer openly or secretely with any affairs taking place on the Balcans south of the Danube for as long as the NAP lasts. 5. Peace agreements with Greece and Romania are to be negotiated seperatly, wich the Russian side will not interfer with. 6. The Ottoman Empire assures Russia that they have no claims on Romania. OOC: This is what has been agreed upon. I put that into the dropbox folder. The Russian party still needs to sign it. We then may need to script the results, as Russia still seems to lack the warscore. OOC: Here the question is, if we are still having inflation implemented for purchases. Allthough I have high respect for Kensai's knowledge about the game and its engine and though I think he was right in most of the technical discussions, I still believe that for the transfer of actual values there should be no inflation. I agree that inflation should not be imposed for purchases. 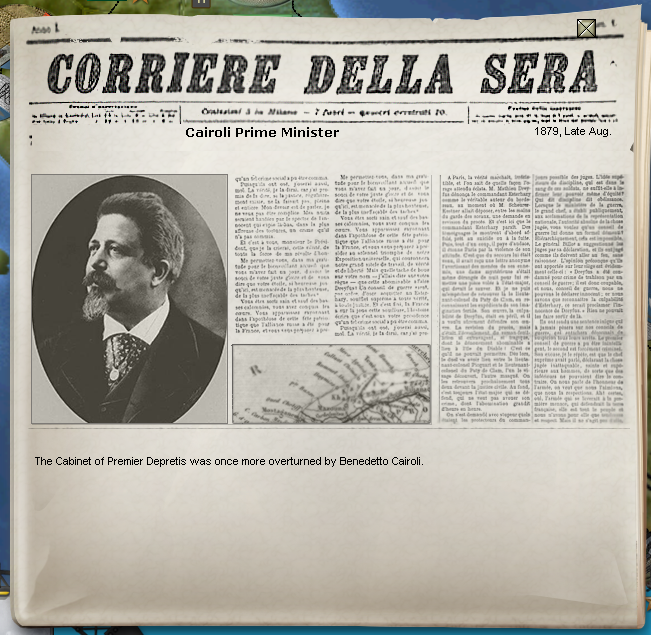 The people of Italy joyfully welcome Benedetto Cairoli as once again Prime Minister of our young kingdom. The King said in public that he places all trust in Cairoli and expects great achievements from this new cabinet. Berlin - German Foreign Office diplomats recently concluded the Treaty of Tsingtao with the Empress of China. Empress Cixi agreed to lease the province of Tsingtao to Germany for a period of 10 years. Chancellor von Bismarck proclaimed the treaty will give Germany a formidable base in Asia from which German interests can be protected. Japan agrees to withdraw from and relinquish all claims to Taiwan and Korea (white peace). A white peace has already been signed between Japan and Korea. -Build 2 Rice Farms in Bangkok, to compensate the expense to rebuild the silk plantations. -The delivery of 160 Silk at a rate of 8 Silk per turn for 20 turns, to compensate the lost of production of the plantations. Japan started to build the rice farms, they have only to write the script to make the transaction of those structures and the Silk. It's manifest the generosity and the aim of the USA to gain the peace, and to correspond Japan invites to the USA to build in Japan soil. Also Japan agrees to improve and hold the relations with the USA to restore peace in the Pacific. No territorial or economic changes (white peace). In compensation for German assistance to China during the war, Tsingtao (Qingdao) will be leased to Germany for a period of ten (10) years. USA-China: In compensation for US assistance to China during the war, Shanghai will be leased to the USA for a period of ten (10) years. Thanks by make it public, all it's fine except the transfer of silk to Brazil. It's 8 Silk per turn during 20 turns not months, to reach the 8*20=160 Silk for Brazil. I'll post the scripts for the japanese part shortly. We thank the Chinese government for publishing the peace terms. The USA will be concluding formal peace now that the terms are public and concrete [OOC- White peace sent to Japan this turn]. Additionally, work on the USA constructed railroad for Hokaido has already commenced. We look forward to working with all nations involved going forward! Cherry Pagoda Inn - Canton 1879 Sept.
Han: Tsingtao leased to Germany, Shanghai leased to the U.S.
Chan: What is the world coming to?! Han: Maybe France would like to lease Canton? Chan: Over my dead body! Chan: Where do I sign? Barkeep! The USA will be concluding formal peace now that the terms are public and concrete [OOC- White peace sent to Japan this turn]. Likewise, China has sent a white peace offer to Japan this turn. China thanks its allies and looks forward to an era of mutual cooperation and prosperity in the region. Since the script may take a time to be applied, Japan will send a white peace offer to Brazil and Germany to accelerate the process and reach the normality. Edit: I can only send a white peace offer to Brazil. I guess then that Germany should send the white peace offer to Japan instead. FIrst, Peace negotiations having reached agreement, a signed treaty has been sent to the Empire of Japan. Second, The United States of Mexico, our ally of long duration, has, without notice, consultation or other advance communication, forged casus belli against the United States of America. A declaration of war on that basis would violate the terms of agreement providing for defensive action only, being a war of offense in our view and one that would bring in other powers. This is a war which, if initiated some months ago, might have been considered an attack of opportunity on the USA at a vulnerable time due to its forces being largely deployed in the Far East. It is believed that the agitation of the preceding Japanese Ambassador at Mexico City in seeking other countries to declare war on Japan's adversaries has borne delayed fruit - a poisoned apple, however, for whomever eats of it. We certainly hope that Reason and Moderation may take hold in Mexico City and the government there withdraw their aggressive action which can only prove a grievous folly if the United States of America are obliged to wage war against Mexico in their own defense. Accordingly, the Empire of Brazil is canceling its Defensive Alliance with Mexico for the present, with full intention to resume mutual defensive support when wiser policies and regard for the terms of our mutual prevail once more in Mexico City. Third, the Foreign Ministry is in discussions in Montevideo with the parties in de facto control of our province of Banda Oriental with the aim of reaching an administrative arrangement for them to clear local troublemakers and restore order and productivity in the provinces. Imperial jurisdiction over Banda Oriental continues to be maintained. The Sublime Porte advises the public that an agreement has been found with the new government of His Imperial Majesty, Kaiser Franz Joseph I. of Austria, to settle border issues on the Balcans and the Arabian Peninsula. Details of the treaty will soon be revealed. The danger of an Austro-Ottoman war is banned for many years. After the agreement with Italy and the peace with Russia, this is another important step towards a safe an prospering Ottoman Empire. The Sublime Porte advises the public that a conference took place at Sarajevo at the beginning of this month with high ranking Austrian and Ottoman diplomats participating and Russian officials as observers. The participants concluded, that a major smoothing of borders is needed to guarantee peace on the Balcans in the future. Thus the respective governments decided the exchange of the following provinces: Przemysl was to go to Russia, as long decided; the province of Bosnia-Herzegovina will go to Austria, whereas the colony of Arabia will go into Ottoman hands. Major economic help for the warshattered Ottomans are included as well as a 10 year non-aggression pact. (details in the dropbox treaties folder). The respective governments of Austria and the Ottoman Empire express their deep wish for peaceful and prospering relationship in the future. At the margins of the conference the Bulgarian Viceroy expressed his wish to secure stability in Sofia again by the presence of Ottoman troops. A wish that we will gracefully comply with. The Russian Foreign Office is happy to announce that during the past months it has been actively negotitating with the representatives of various countries. As a result, non-agression commitments were undertaken vis-á-vis China and Austria-Hungary, on a reciprocical basis. Further, an extension of the NAP with GBR was also agreed earlier and put into the archives. Interested parties are invited to review the terms of the treaties and sign or propose amendments, if necessary, accordingly. As soon as the new administration entered office in Vienna, their first plans were to secure stability and security for all of its citizens by neutralising any possible threats by diplomatic means. NAP's have solved this potential issue and the transfer of Bosnia to Austria has secured the populations of that area too, they can now rest assured that their interests are firmly at the forefront of our political agenda. We would like to thank our Ottoman and Russian counterparts for their co-operation in this matter and look forward to friendly and working relationships with both of our wise neighbours. Record Growth: The latest reports indicate increases in population levels in 7 cities within the Empire of Brazil from the largest to the smallest, a record for the rate of increase. Britain and Ottoman Empire agree to the sale Ironclad Battleships. The script works, and can be found here on post 36. OOC - I admit it's not pretty, but it is functional. The Sublime Porte advises the public, that due to massive investments into the educational system and scientific research our shipyards can now build ironclad ships. Thanks to the support of our British friends we can now rule the seas with several squadrons of battleships of the new kind.